Governor Chet Culver’s last “Condition of the State” message struck an optimistic tone, closing with some advice. Culver, a Democrat, began by congratulating his November opponent, Republican Governor-elect Branstad and Branstad’s lieutenant governor, Kim Reynolds, wishing them “Godspeed and good luck” as they take office on Friday. Branstad declined Culver’s invitation to attend today’s speech and Culver will not attend Branstad’s inauguration “as a courtesy,” according to Culver’s staff. A large section of Culver’s speech was dedicated to a review of what he described as positive notes in Iowa’s economy. 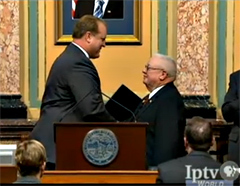 Governor Culver and Senate President Jack Kibbie. “Our job creation and workforce development efforts are now paying big dividends. In fact, our unemployment rate is now at 6.6 percent, or 33 percent below than the national average, and the 7th lowest in the nation,” Culver said. Culver also mentioned some of his key initiatives, like expanding state support of preschool and raising the minimum wage. Culver said he and other Iowans “stood tall to protect the constitutional rights of all Iowans regardless of race, gender or sexual orientation” — his way of referencing the gay marriage issue. Culver’s four-year term as governor officially ends at about 10 o’clock on Friday morning when Governor-elect Terry Branstad takes the oath of office. Culver will not attend that event, and Branstad didn’t attend today’s speech at the statehouse. According to Culver’s staff, the two men didn’t want to detract from an “orderly transition” by appearing in the same public place at the same time this week. Culver closed his “Condition of the State” message with a bit of advice for legislators and the incoming administration,. Republican legislative leaders are laying plans to undo many of Culver’s initiatives, however. House Speaker Kraig Paulsen, a Republican from Hiawatha, sat behind Culver as the governor delivered his final “Condition of the State” address. House Republican Leader Linda Upmeyer also thanked Culver for his service to the state. On Wednesday the interim chief justice of the Iowa Supreme Court is scheduled to give a formal speech to lawmakers. Justice Mark Cady wrote the 2009 opinion on gay marriage which has sparked controversy. Read the text of Culver’s speech below. Members of the General Assembly, President Kibbie, Speaker Paulsen, Leaders: Gronstal, Upmeyer, McCarthy and McKinley, thank you for the opportunity to address this joint session of the Legislature. To my fellow statewide elected officials, members of the Iowa Supreme Court and Iowa Court of Appeals, thank you for being here this morning. I want to congratulate the newly elected legislators and statewide officials, including Governor-elect Branstad and Lt. Governor-elect Reynolds, on your victory. I wish you Godspeed and good luck in the future. To members of our Board of Regents, including President Miles, and University Presidents Mason, Geoffrey and Allen, I want to say it’s been a pleasure to work with you. It’s fair to say that no state in the nation enjoys the leadership and recognition that our three outstanding public universities do. The same is true for the leadership of our community colleges and private colleges. Finally, as the commander in chief of the Iowa National Guard, I would like to acknowledge the outstanding leadership of Adjutant General Tim Orr, and thank the men and women who wear the uniform. We are now in the midst of the largest single overseas deployment of Guard troops since World War Two. 3,100 of our brave fighting men and women are currently deployed in Afghanistan. Sadly, during the last decade, 77 Iowans have given the ultimate sacrifice in Iraq and Afghanistan. Hundreds of others also have been injured. We honor their sacrifice today and I ask you to always keep their families in your thoughts and prayers. That’s why I am so proud last year Iowa became the first state in America to pass the top ten recommendations from the U.S. Department of Defense to support our troops, their families, and our veterans. One of the highlights of my term was having the opportunity to visit and spend time with our troops, in Iraq, Kosovo, and at Camp Ripley in Minnesota, during pre-deployment training. And what an awesome honor for me, to formally recognize Iowa’s own Medal of Honor winner and the first living recipient since Vietnam, Staff Sgt. Sal Guinta, here at the Capitol. So, we’ve kept our promises to our brave men and women in uniform and our state is stronger for it. I stand before you, for the last time, entrusted by the constitution with the duty of updating you about the condition of our state. As you can imagine, I do so today with a broad range of emotions. First of all, I am confident our administration has left the state in a better position than we found it. In fact, last fall Iowa was acknowledged in a national publication as being the 3rd best run state in the nation. So, I am happy to report the condition of our state is strong today, and we are well-positioned for growth, greatness and prosperity tomorrow. This is especially true when it comes to renewable energy, our children, new 21st Century jobs, and disaster recovery. Today, Iowa is number one in the nation in renewable energy. We now generate 20 percent of our power from renewable sources, up from just 5 percent four years ago. With the help of our private sector partners, including MidAmerican and Alliant Energy, in the past four years we’ve built 40 wind farms. We’re one of only 2 states manufacturing wind towers, turbines and blades, the three component parts of a windmill. And, more than 200 Iowa small businesses are now employing thousands of people in the wind energy supply chain. We have more than 4,700 windmills operating across the state, enough to power more than 1 million homes. And, exciting new transmission plans are now in place to build out our electric grid. This will allow Iowa to one day sell excess power to cities like Chicago. So, we have accomplished our goal of becoming the renewable energy capital of the United States. One of the tools we used to accomplish this goal is the Iowa Power Fund. It has allowed Iowa to become the silicon prairie of the Midwest. To date, we’ve invested more than a quarter of a billion dollars, in public and private funds, into 40 cutting edge 2nd and 3rd generation research and development projects. These breakthrough technologies and solutions will help Iowa secure its renewable energy future. To Chairman Fred Hubbell and the members of the Iowa Power Fund Board, and to Roya Stanley, Director at the Office of Energy Independence, I salute and thank you for your visionary work. We’ve also helped increase production of biofuels statewide by supporting and expanding tax credits for biodiesel, ethanol and E-85 at the federal and state level. And, this year, as Chairman of the National Governor’s Biofuels coalition, we successfully pushed for an E-15 waiver from the Environmental Protection Agency. This will allow Iowa to produce millions more gallons of ethanol annually and keep us on a pathway toward energy independence. When it comes to investing in Iowa’s children, we also have made great progress. Today, we are number one in the nation in children’s health insurance. No state has done more to cover kids in the last four years. We’ve added 58,000 kids to the rolls, and as a result 99 percent of Iowa’s children are now getting basic health care services. In addition, we are leading the nation in expanding access to preschool. During the last three years alone, 23,000 additional children have been enrolled in early childhood education programs. As a result, 90 percent of 4-year-olds now have the opportunity to attend a quality preschool program, up from just 5 percent a few years ago. We’ve also had a clear and consistent focus on creating new 21st Century green-collar and information technology jobs. Our state is now home to more than 8,000 green-collar jobs, and 8 new wind energy companies are now operating in Iowa. In addition, three international information technology companies, Google, Microsoft and IBM, have created nearly 2,000 new IT jobs in the last 3 years. And, thanks to our Department of Economic Development and its board of directors, we’ve partnered successfully with 280 businesses that have agreed to create or retain a total of 28,000 good-paying Iowa jobs. In addition, our workforce development efforts have allowed for real progress in coordinating the needs of our employers with the skills of our workers. Community college enrollment is at an all-time high and our successful community college job training and worker retraining programs have allowed us to help more than 100,000 Iowans find a job. So, our job creation and workforce development efforts are now paying big dividends. In fact, our unemployment rate is now at 6.6 percent, or 33 percent below than the national average, and the 7th lowest in the nation. As a result, Iowa has now regained more than a third of the jobs it lost during the recession and just last week it was reported that we’re now on track to reach pre-recession employment levels by the third quarter of 2012. These efforts have allowed Iowa to lead the country out of the recession. 13 of our 19 largest companies just reported double-digit stock gains in 2010, and we are the only state in the nation to post 14 consecutive months of sustained economic growth. These positive signs, coupled with our $950 million surplus, clearly show the strength of Iowa’s economy. You know, these last four years have been challenging times for all of us. Together, we’ve faced unprecedented natural disasters. We’ve seen the destruction of tornadoes and floods that killed and injured so many in communities across Iowa in 2008, and again in 2010. The images from places like Cedar Rapids, New Hartford, Palo, Coralville, Waterloo, Parkersburg, Cedar Falls and Oakville, told the story of the damage and devastation better than any words ever could. But, I have never been more proud of Iowans. We showed the best of Iowa in the worst of times. Despite tough times, we’ve come together, to build the foundation for a better, stronger, and more resilient state — one that is now well on its way to a full and complete recovery. We stood together, shoulder to shoulder, united as one, committed to rebuilding our state from our worst natural disaster ever. And, together we’ve helped ease the pain for those who lost so much. To date, we’ve secured more than $5 billion in state and federal funds for recovery, rebuilding and flood mitigation efforts. This includes $1 billion for Linn County alone. I would like to thank Retired Lt. General Ron Dardis and the entire Rebuild Iowa Office for their tireless work on flood recovery. As a result of our efforts, we’re rebuilding Iowa in a stronger, safer and more sustainable way. Together with the help of legislators from flood-impacted communities, we created the Iowa Jobs and Infrastructure Initiative, or I-JOBS, to provide funds totaling $330 million for nearly 100 separate flood recovery and mitigation projects in 37 flood-affected counties. These include: new fire stations in Elkader and Charles City; a new public library and National Czech and Slovak Museum in Cedar Rapids; replacing 10 buildings at the University of Iowa including Hancher Auditorium; and a new flood wall that will now protect 200 small business owners along the Coralville strip. So, we’ve accomplished a great deal together and moved our state forward these last four years, despite governing through some very challenging times. I am very proud of our record and I am deeply grateful to have had the opportunity to serve as the 40th Governor of Iowa. Looking back, perhaps one of the things I’m most proud of is that we kept the promises we made to Iowans. We did what we said we were going to do. We raised the minimum wage. Increased teacher pay. Made our public places smoke-free. Lifted the ban on stem cell research. Protected civil rights: at home, in the workplace and for our students in schools. Balanced the budget four years in a row, and earned a triple-A bond rating. In addition, we tackled racial disparity in sentencing and youth detention. Appointed a record number of women and minorities to boards and commissions. Passed the first in the nation minority impact legislation. And stood tall to protect the constitutional rights of all Iowans regardless of race, gender or sexual orientation. Finally, we reduced state spending. Reformed and reorganized government. Streamlined and consolidated operations. Offered early retirement to 2,200 state employees. Implemented strategic purchasing. Reduced our state vehicle fleet. And eliminated redundant email and information technology services. All of these important reform measures have helped us create a record $950 million surplus, will save us more than $300 million annually, and put us closer to the smaller, smarter and more efficient government our taxpayers deserve. The reason our record of accomplishment was possible is because I had the privilege of working each day with extraordinary Iowans, and the list of people I want to thank is long. First and foremost, I want to thank my wife, Mari, and my entire family, including my parents, siblings and relatives, for their constant and unwavering love and support. I am very proud of the fact Mari has been one of the state’s leading advocates for at-risk women and children. In fact, a few weeks ago she was recognized as the 2010 “advocate of the year” by Children and Family Services of Iowa. So, Mari has been a great First Lady, and at the same time an incredible mother to our two children, of whom we are both so proud. Please join me in thanking the first lady for her service, and welcoming our children, John and Clare, to the chamber. I also want to extend a huge thank-you to Iowa’s Lt. Governor, Patty Judge. Patty has been the best partner a Governor could have. She’s served as an important adviser on matters big and small. And she’s been an excellent oversight executive for the state’s homeland security and emergency management agencies. The State of Iowa is a better place because of Patty Judge’s more than 20 years of public service, as a State Senator, Secretary of Agriculture and Lt. Governor. Please join me in welcoming and thanking the Lt. Governor. Additionally, I want to thank my chief of staff, Jim Larew, Deputy Chief of Staff Joni Klaassen, and the directors of our state’s 38 departments and agencies, who showed dedication to our cause and worked hard every day to move this state forward. I want to say thank-you to each of you for your outstanding public service. Your expertise, advice and input have been invaluable. I also have been blessed with the opportunity to work every day with a great team of individuals in the Governor’s and Lt. Governor’s office, along with thousands of exceptionally talented state employees across Iowa. They include state troopers who put their lives on the line every day to protect us; snowplow drivers who clear our highways after dangerous winter storms; corrections officers who protect our communities from our most dangerous criminals; nurses at the University of Iowa hospitals who take care of our loved ones; the cafeteria staff who will serve many of us lunch today, and the custodians who come in every night to keep this Capitol building one of the most beautiful in the nation. So, to every member of our state government team, I want to thank you for your professionalism. You make certain state government provides the kind of service Iowans expect. You have served Iowans with great competence and heartfelt commitment. For that I thank you. Finally, to all members of the General Assembly and leadership on both sides of the aisle, I’d like to say thanks to each of you for being important partners in the progress we’ve made to leave Iowa a better place than we found it. So, the condition of our state is strong; we’ve made the tough decisions; and we’ve kept our promises to the people of Iowa. However, despite our progress, our work as a state is never done. For example, just today, the Department of Management is releasing our required biannual report detailing progress on our government reform and reorganization initiative. This report identifies additional steps that should be can taken, such as improved debt collection, further information technology consolidation and targeted strategic purchasing. These steps will save $84 million in the current fiscal year. I encourage you to continue these efforts. We’ve also passed along a detailed report to the incoming administration that includes five proposed changes in Iowa law that will help improve egg safety and training standards in the wake of the salmonella outbreak last summer. These are only two examples of ways in which your action will be necessary. But I have no doubt you will meet these challenges and many others head-on. In conclusion, we’ve been through a great deal together. From the largest natural disaster in our state’s history, to the largest economic downturn since the Great Depression, to the H1N1 flu Pandemic and the largest troop deployment since World War Two. Time and time again, we have successfully overcome our challenges, and I believe we are a better state and a better people for it. Our resilience is tied directly to our inherent optimism — a belief that things will get better and that our best days are ahead of us. We are also a people of strong faith and character who believe in our Iowa values of hard work, determination and common sense. So, we now stand at a critically important time for Iowa. Our state’s direction and destination are up to each of you. I want to encourage you in the clearest possible terms to keep Iowa moving forward. To build on our strengths, especially in the areas of renewable energy, investing in our children, creating the jobs of the future and completing disaster recovery efforts. The vision of Iowa we should all stand for is not a partisan vision, a political vision or a self-serving vision. It’s an Iowa vision, one that will move the people of this state forward, unlock their unlimited potential and improve their quality of life. May God bless you, and may God bless the people of the great State of Iowa. Thank you.